Baldwin has a 60 year legacy of craftsmanship and innovation. Rated #1 in quality by builders and contractors, Baldwin is pleased to offer a line of luxury hardware for the discriminating consumer, our Prestige Series. Feel the difference - Baldwin hardware is solid throughout. With a 60 year legacy of superior style and quality, Baldwin is the choice for an elegant and secure presence. Avondale's stylish arched shape accented by graceful beveled lines emanate exquisite sophistication. This single cylinder handle set can be locked or unlocked by a key on the outside, or the turn button on the inside. Tobins refined curves and sleek contours are delightful to the eye and pleasing to the touch. The Polished Brass finish adds to the traditional look and feel of the product and makes a classic statement. SmartKey Re-key Technology allows you to control who has access to your home. Re-key the lock yourself in seconds in 3 easy steps. Have you recently moved or had a child lose a key. Upgrade the basic push button handle that may already be on your screen door with this elegant and easy to operate handle.This storm door hardware set includes an elegant lever handle and an integrated keyed deadbolt. It compliments a wide range of dicor styles, and is compatible with most pre-installed surface-mount handles.FEATURES The interior latch features an easy opening push movement.The integrated keyed lock provides additional security, so you can keep your main door open and enjoy the light and fresh air while still feeling safe.This set includes everything needed for an easy installation. The package includes screws and spindles to fit doors from 1 in. to 2-1/8 in. thick (spindles can be cut to suit the width of your door).NEW INSTALLATIONS New installations should take about 45-60 minutes. You'll need to drill a new 7/8 in. hole for the key lock. Before drilling, ensure that the inside latch and lock do not interfere with the operation of your main door handle.Tools required:-Tape measure-Drill-7/8 inch spade bore drill bit-Screw driver-A center punch to mark the holes is helpful.REPLACEMENTS When replacing an existing handle, please verify carefully the dimensions and configuration of your existing handle set. There are lookalike sets on the market that look the same from the front but are significantly different and will not be compatible.This handle set uses the 2 posts with 1-3/4 in. spacing which is standard to most storm door handles. Other brands use up to 4 posts. Each post requires a hole to be drilled through your door.This handle has 3 in. between the handle and the key lock. Other brands are different.The interior lock in this set is fastened directly to the inside face of the door, and does not connect to the outside handle. Prestige Avendale Single Cylinder Polished Brass Handle Set with Tobin Lever with SmartKey Baldwin has a 60 year legacy of craftsmanship and innovation. Rated #1 in quality by builders and contractors, Baldwin is pleased to offer a line of luxury hardware for the discriminating consumer, our Prestige Series. Feel the difference - Baldwin hardware is solid throughout. With a 60 year legacy of superior style and quality, Baldwin is the choice for an elegant and secure presence. Avondale's stylish arched shape accented by graceful beveled lines emanate exquisite sophistication. This single cylinder handle set can be locked or unlocked by a key on the outside, or the turn button on the inside. Tobins refined curves and sleek contours are delightful to the eye and pleasing to the touch. The Polished Brass finish adds to the traditional look and feel of the product and makes a classic statement. SmartKey Re-key Technology allows you to control who has access to your home. Re-key the lock yourself in seconds in 3 easy steps. Have you recently moved or had a child lose a key. Prestige Avendale Single Cylinder Polished Brass Handle Set with Tobin Lever with SmartKey is rated 4.6 out of 5 by 28. Rated 5 out of 5 by Dennis from Easy install and looks great. Exactly what I wanted. ... Easy install and looks great. Exactly what I wanted. Rated 5 out of 5 by Randall from Beautiful product and well made and priced.... Beautiful product and well made and priced. Rated 5 out of 5 by Hopper from Gorgeous Brass Handle Set Our front door got a nice fresh coat of paint. We wanted our entrance way to be inviting and classical in design. We researched several sites / stores until we found this gem. 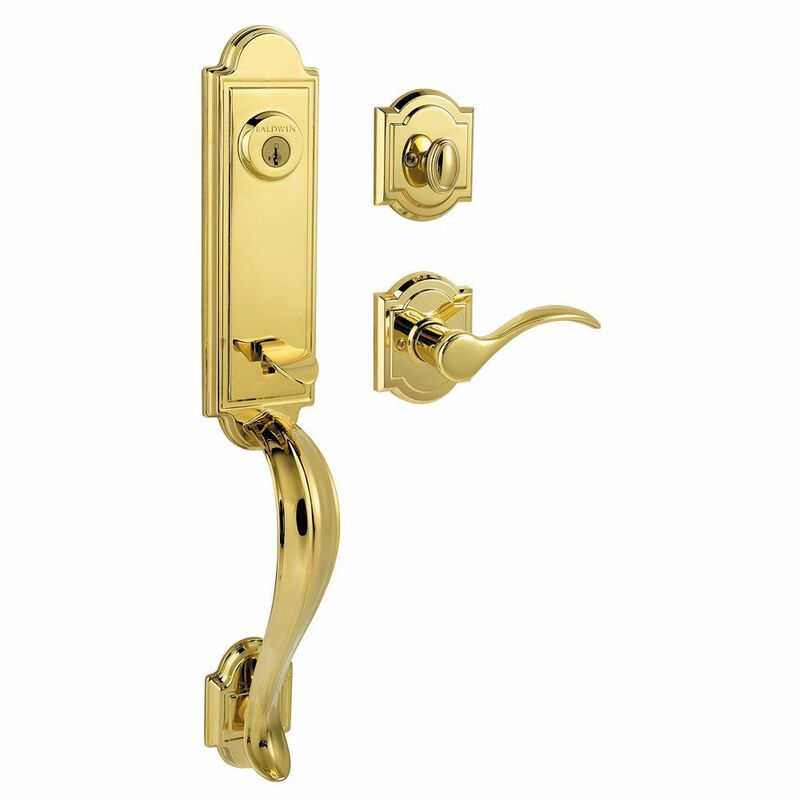 This Baldwin handle set--Prestige Avendale Brass set with Tobin lever was only on Home Depot's site. Absolutely gorgeous, solid and with style! We highly recommend this product. Rated 3 out of 5 by Mikez from Lock broken within 4 years Bought this beautiful lock in 2014. Couple of months ago, noticed the key become kind of loose when turning it to lock or unlock the door. Today I can’t use the key to open it anymore. it only last less than 4 years. Very disappointing!